Sawbench is the starting point for The Marin Trail, a mountain bike trail with big climbs, big descents, singletrack and great scenery. It is a red graded mountain bike trail which means it is only suitable for proficient riders with good off-roading skills. For walkers, there is a short walk with great viewpoints overlooking the market town of Llanwrst. Lady Mary's Walk 1.3 miles, 2.1 kilometres. This short historic walk takes in some fantastic viewpoints giving glimpses of the old market town of Llanrwst, its surrounding hills of farm and forest and introduces some of the local characters and landmarks that draw visitors every year. The walk is named after one of two Lady Mary's (we don't know which one) from the Wynne family who bought the land and built up the estate, including a viewing mound, chapel, summer house (Gwydir Uchaf - about 500m walk off this route) and a bowling green. The walk takes in two sculptures by local artists, one a memorial to the old Llanrwst Town Hall placed to maintain the precious link between the town and the forest. The trail follows forest roads and narrow forest paths, with a steep climb from the car park with two chicanes. You can download the walk leaflet from the Natural Resources Wales website. Turn west off the B5106 near Gwydir Castle, Llanrwst, onto a minor road into the forest. Then take the first forest road on the left signposted Sawbench/Mainc Llifio. The nearest train station is in Llanrwst. The OS grid reference is SH 790 609. 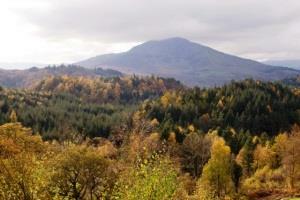 The Gwydir Forest can be accessed from eight different car parks and locations. Most of which are close to refreshment places and toilets. Please note: Sometimes we need to close or divert trails for your safety whilst we undertake maintenance work or forest operations. Occasionally we may have to close a site in extreme weather, such as high winds or snow and ice due to the risk of injury to visitors or staff. Please always follow any instructions onsite and make sure you follow any temporary diversion signs in place. Minor road East off the A470 in Llanrwst. Various access points off the A5 between Capel Curig and Betws y Coed.